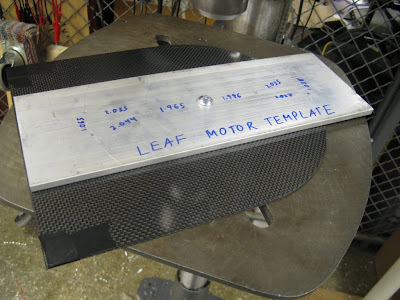 Shane Colton: LEAF Motor Blitz: Everything but the Windings. LEAF Motor Blitz: Everything but the Windings. One of the most important lessons I've learned in the last six years of engineering study is how to slow down, organize, and carefully execute a big project. But screw it, sometimes you just have to put the gas down. It's gone through significant refinement from the Feb 4 concept mostly as I realized the particular characteristics of a coreless stator that made the design more flexible. 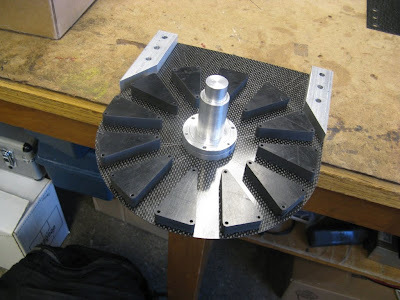 The most obvious change is in the mounting and loading: One benefit of the coreless design that I didn't mention in the last post is that, at least in open-circuit, there are no axial forces between the rotor and stator. 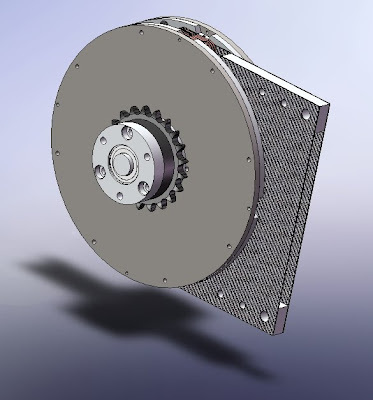 In fact, in open-circuit, there are no magnetic forces at all between the rotor and the stator. No cogging. The only forces paths are between the two rotor disks. There is still a tremendous axial force, almost 500lbf, trying to squeeze the two disks together (and crush your fingers in the process) but the coreless version doesn't suffer from the air gap instability I mentioned here, where one rotor disk or the other would rather snap to the stator than maintain an equal air gap thanks to the 1/r^2 law. 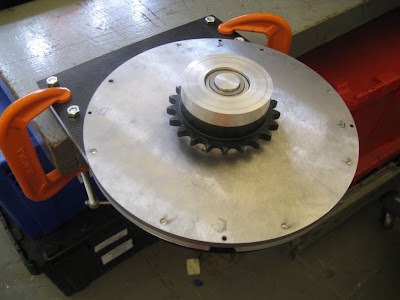 There's also a very large torque holding the two magnet disks in alignment, much larger than the torque the motor itself is usually producing. All this means that the outer can is, in fact, optional. 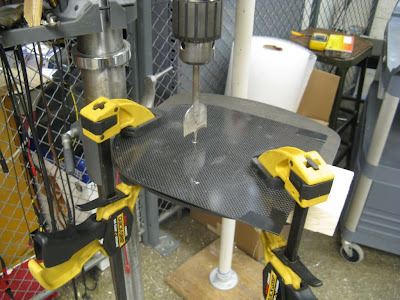 It does provide a degree of stiffness, but with 1/4" steel-backed magnets, rotor stiffness is the least of our problems. The shaft is actually integrated with two machined aluminum hubs. The structure is essentially a sandwich of ABS plastic winding inserts (the black triangles) in 1/32" carbon fiber, with a bit of aluminum thrown in outside the magnet area where extra stiffness is required, such as at the mounting points. The inside thickness of the sandwich is 1/2". Yep, a wood-cutting spade drill. (Wood is made of carbon too, right?) 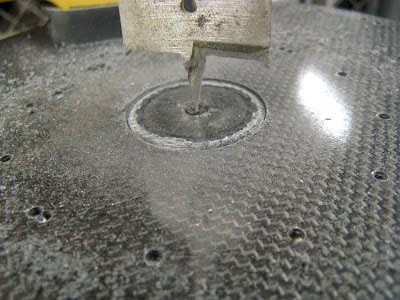 The pointy edges cut through the thin carbon fiber sheet very nicely just before the flat spot hits the surface. The result is a remarkably stiff stator sandwich that weighs about 750g and looks really cool. The windings will add another 1.25kg or so to the stator mass, but more about those later. Even though the rotor disks are no longer attracted to the stator, they still suffer from the 1/r^2 problem with each other. Meaning, they would potentially tend to close the air gap on one side of the circumference while opening it wider on the other side, rather than sharing it evenly all the way around. Furthermore, there will be large forces and torques on the rotor disks from the load as well, coming in through the chain and sprocket. All this suggests that the single conical bearing, even magnetically preloaded, is not at all sufficient to hold the air gap. 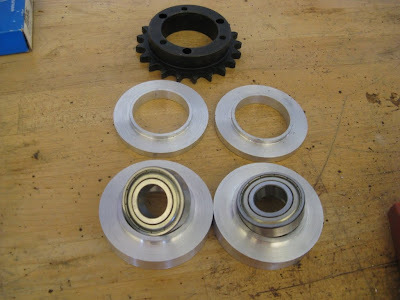 Without an outer can linking the structural loop, they are under-constrained. And it spins quite nicely. There will be sprockets on both sides, mostly for symmetry, but it could potentially drive a split axle. I'd like to believe it would behave like a limited-slip differential, but honestly don't know what this would do. So that leaves the winding. And here I have one last trick: flat magnet wire! 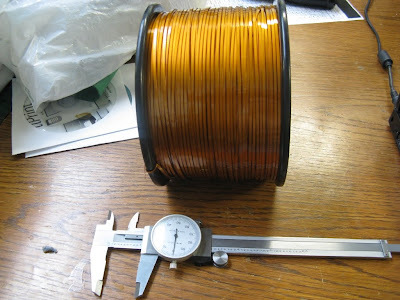 Processed by Alpha-Core, this stuff is rectangular cross-section enamel-coated magnet wire. While it may actually be more difficult to wrap a normal motor with this wire, because it can't twist, it's significantly easier in this case. I can take off an individual winding insert, spin it around while pulling some wire off the spool, put a bit of epoxy to hold it in place, and then screw the insert back in place. (Okay, that makes it sound easy... It's still a time consuming process, which is why I haven't actually done it yet.) The result is a relatively tightly-packed winding that also has a thinner cross-section, cutting down on eddy current loss. The best part is that I can wind the whole motor. Meaning, it can actually run. 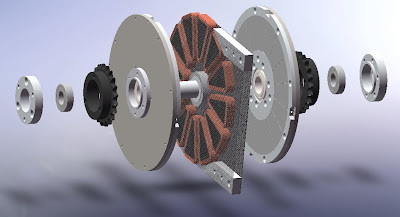 It won't be the 30kW monster that this project originally targeted, but it will still fall into the high-single-digit horsepower category, and weighing in at just about 25lbs. It should get pretty good efficiency numbers as well. Testing to begin soon!